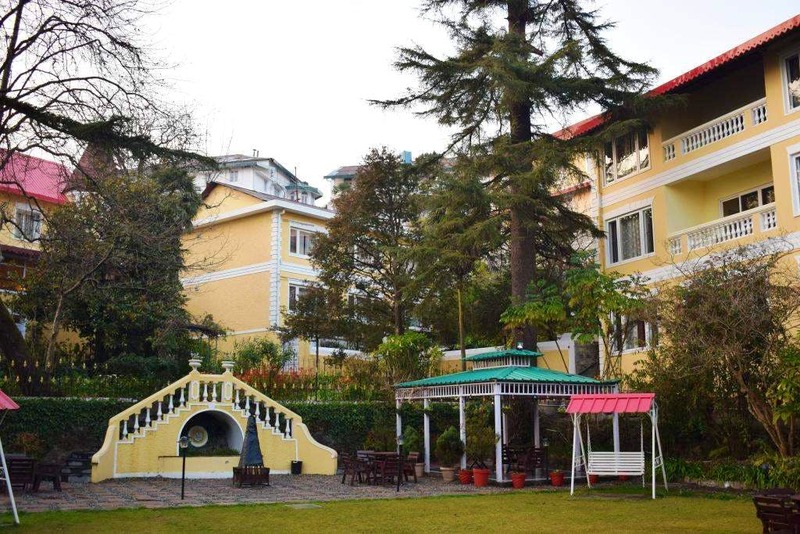 Head To WelcomHeritage Kasmanda Palace In Mussoorie! Red sloping roofs, yellow walls, and white corners—there’s something fairytale-like about the WelcomHeritage Kasmanda Palace. Dating back to 1836, this heritage hotel has a story in every corner. And if you spend some time with its current owners, Raja Dinraj Pratap Singh and his wife, you’ll get to hear the stories and about their ancestral lineage. They live on the premises and are involved in the day-to-day operations. And that’s why it seems less like a hotel and more like a well-run home. Kasmanda is a region in Uttar Pradesh, ruled by Singh’s ancestors, on the trade route to Nepal. The lineage can be traced to the Mughals on a stone at the entrance. And not only the family, the building too has seen many changes—from being built by a Britisher to becoming a hospital during the Crimean War, then changing over to a school and finally a place where visitors enjoy some rest and relaxation. The story of Basset Hall Estate turning into Kasmanda Palace can also be traced on another stone at the entrance. With roots going deep, from the moment you walk in, the old-world charm casts a spell. The wooden staircase and wooden reception make you feel like you are in a 1970s movie. Turn around, and you will see paintings of the rulers of Kasmanda. There are trophies too; stuffed tigers, deer, and bear heads, but well, we did evolve from the hunter-gatherer society to a technology-driven one. Explore the corridors, and you will see the pictures of Kasmanda fort and palace in UP. With five categories of rooms, it’s quite a pleasure to walk around this home-turned-hotel. The décor is light and flowery and adds sunshine and colour to your stay and transports you to the Victorian era. There are four-poster beds, big windows, and a view to die for. Imagine waking up to the sun bursting through the sky brightening up your day—that’s what you are treated to at Kasmanda Palace. The interesting part is that each room is different here. Relics of the past adorn the corridors. I loved the big radio in one area. The restaurant serves fresh home-cooked meals. I enjoyed the dal and upma. There is a separate kids’ area. But the pleasure lies in the garden and the viewpoint. That’s the place to read a book, meditate or go off to sleep. I saw an area for bonfires too. The estate also has the famous Christ Church, which is open only on Sunday and has beautiful stained glass paintings. You can walk down to the Mall road, takes barely five minutes. The hotel also has a car which can take you down and bring you up. This is quite a crowded road with cafes and shops. Oh, there is a cinema hall too. Another heritage building here is the Mussoorie Library, dating back to 1846. The library houses 15,000 books including old hardbound editions and has 70 active members. And only members are allowed inside the premises which houses big, restful lounging chairs for reading in comfort. You can walk down to Landour which is an easy trek and takes around two hours. Or you could hire a cab and be there in 25 minutes. I was lucky enough to get a clear road, but I am told that it’s normally jammed. Lal Tibba is where the sun turns the mountains red at sunrise and sunset. You need to pay INR 50 to climb up and see the mountain tops through the big binoculars. Drive down to Char Dukan, which is a row of cafes and it’s the cantonment area, hence beautifully maintained. There is a 150-year-old St Paul’s Church here. You could go a little further to see the boundaries of Woodstock School, Sister’s Bazaar with a bakehouse, and Prakash’s shop which sells yum chutneys and jams (I came to know this later or would have picked up some). And then take the road which crosses famous author Ruskin Bond’s home and Dolma Inn. If you are around on the weekend, then you could meet the grand old man at a stationary shop in the mall where he comes to meet his fans and sign books. The hotel does not serve hard liquor, only beer.